Uh-oh! Love Christmas? Hate Brussels sprouts? 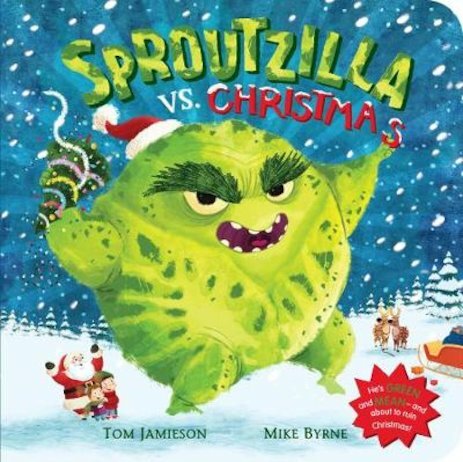 Mean, green Sproutzilla is on the rampage – and he’s headed straight for Santa! It’s very merry YUCK! OK: hands up if you don’t like sprouts. Here’s a secret: nor does Jack, the hero of this story. He loves (nearly) everything about Christmas – except for those pesky sprouts. Bleeugh! So when Jack’s parents bring home the biggest sprout you’ve ever seen, he knows there’s trouble ahead. And when evil Sproutzilla comes alive and attacks Santa, it’s up to Jack to save Christmas. But can he really eat such a HUGE sprout?